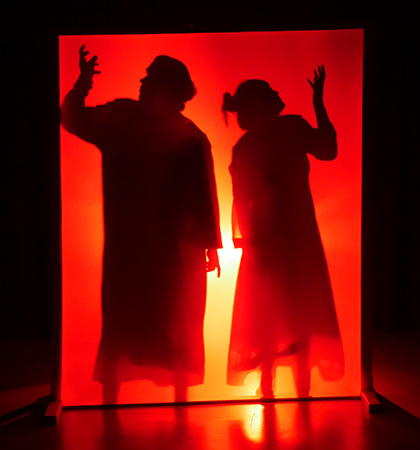 Drama students at The Sixth Form College, Solihull have been demonstrating their skills in physical theatre this term and their efforts will culminate in a public showcase to family and students. First year students on our A level Drama course performed extracts from a variety of original and adapted plays by renowned physical theatre practitioner Steven Berkoff. The extracts are taken from his full length plays “Metamorphosis”, “The Trial”, “Decadence” and “Salome” (a physical adaptation of Oscar Wilde’s play) and the students have been performing these extracts for their assessed practicals. Each performance lasted between 7-15 minutes. Two groups performed three different passages from “Salome”, another group performed an extract from “Decadence”, Berkoff’s biting satire of the upper classes, while two more groups took on “Metamorphosis” and “The Trial”, adaptations of Franz Kafka’s dystopian novels. Second year A level Drama students will also get their opportunity to put on a showcase next month; this takes place on Thursday 21 March (5.00pm) and tickets are available for that performance now. Costing £8 for adults and £4 for concession and with all funds raised going to the Drama department, tickets are available to current students via ParentPay and to everyone else by calling 0121 704 2581 or emailing Central Admin.